I’ve never been a winter person. In Cape Town, the sky is dark whenever the wind blows since it usually only blows when there’s a storm brewing. The cold North West wind is not as consistent as our summer’s South East wind. It is up and down and the unpredictable gusts have actually killed and seriously injured kitesurfers in the past. It is cold and miserable, but it would never keep us out of the water. We hate it and we love it. Even if you are shivering, if your hands are numb or it suddenly starts raining, we do it for the love of the sport! But that said, it is still not that bad. We can sometimes have the most beautiful, sunny winter days and our winter is very mild compared to other places in the world. It got me thinking that there must be kitesurfers out there that have much worse winter conditions than me. And even some kiters out there that constantly have cold, stormy and even freezing weather, no matter the season! So I went on a search to find some extreme kiters who face the harshest conditions for the love of their sport, and here’s what they had to say! I’ve been kiting now about 13 years. In winter time Espoo/Helsinki area is covered in ice depending on winter but Hanko which is 120km away usually stays open. In winter time I also kite on ice/snow. The coldest weather on snow was around -20C and you have to be careful with your rubber valves in those temps. I’m still trying to get a perfect kiting day, first in water in Hanko and then on snow in Espoo. I mostly go kiting alone because I have flexible working hours. It takes some time to get used to changing clothes outside in 0C but it’s only temporary to get you to from A to B. Normally it’s warmer in the water because your body generates heat. But of course you have to dress up for the worst, so I have enough fleece under my drysuit. There are days when your hands are freezing and aching like hell but it’s also a sign for me to start moving more. The best weather is when there are small waves that force you to keep moving. It’s also more important to not go to the water hungry and once I get hungry, I get out of the water because if something happens I might not have enough energy to swim back to shore. I’m from Austria and my homespot is on the Neusiedlersee. 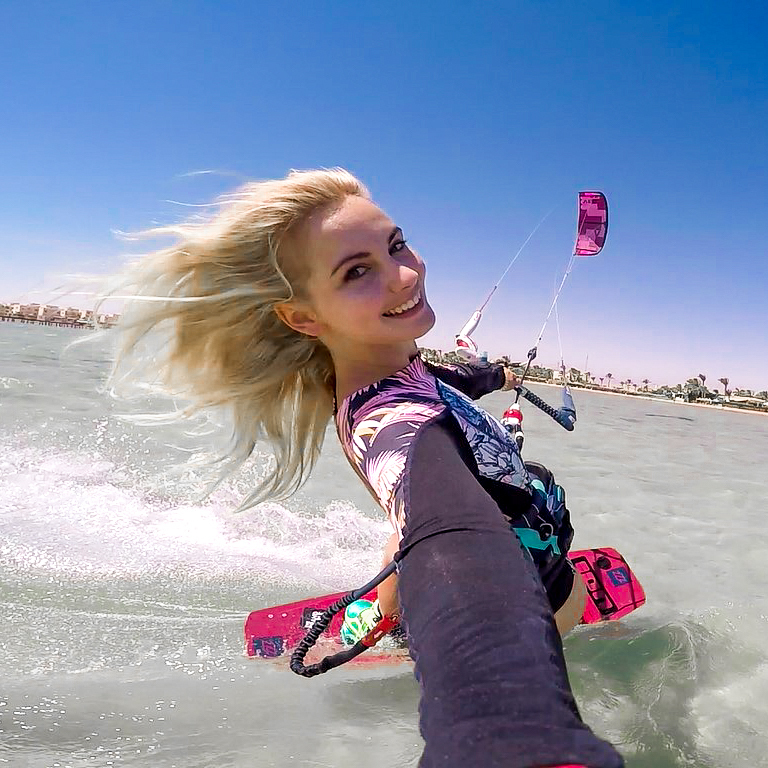 The wind at the lake is driven by frontal systems, and especially in spring, autumn and winter it’s often quite cold for kitesurfing – especially when you add the wind-chill! I usually kite there until the end of November, sometimes even in December and then from February/March on again. The coldest water temperature I had was 3 degrees … and the air was also something like that. Some kiters even go on the water when the lake is frozen and they kite in between the ice floes. Snowkiting is also quite popular in Austria, but that’s another story … (and even colder, of course ;)). I am from Latvia, Riga. Our winter used to be like normal European winter – with snow for 3-4 months. Now lately it is just 1 snowy month – usually January. Typically it does not really get cold until end of December, then January we get -5 to -15 C and starting from February it is getting warmer gradually. Only a small fraction of Latvian Kiteboarders kite when temperatures are super low. Want to know how to survive these grueling conditions? Keep a look out for my next blog – featuring tips from all these brave riders on how they survive and how they motivate themselves to get out there!